Mark Brusse is constantly looking for sources of inspiration by exploring the distinctive features of cultures and locations. His work brings viewers face to face with the ironic enigma of the purposeless machine, the game leading to other dimensions of signification, unconnected with actual ordinary meanings. In Brusse’s artworks, meaning is found way beyond the obvious. Determining factors in his iconography, his passage through New York City and Berlin, his encounter with musician John Cage, with whom he collaborated in the 1970s, anticipate the interest in the East that Brusse has shown over the last decades. His discovery of the pottery and porcelain art of Japan, where he worked for a few months, was another turning point, as well as the bronze casts produced in South Korea. Every local culture has left an imprint in Brusse’s imagery, together with the search for the expressive potentials of different materials. Thus, in South Korea Brusse discovered hanji, or Korean paper, which he has pasted on canvas and painted with warm colours to create images of great metaphorical power. The introduction of bronze into Brusse’s sculpture, added to rough stone elements, or incorporating inlaid pebbles, has renovated his sculptural practice, able to describe a different poetic reality superimposed on our daily lives. Traces of his Dutch culture and training, however, are particularly conspicuous in the way that Brusse handles his materials and in the refinement of certain details, closely related to the traditional craftsmanship of his home country. In recent years, Mark Brusse has built public sculptures in Europe, Asia, Africa and the Americas. As statements of his own personal poetics, all of them show Brusse’s will to go beyond the boundaries of his own oeuvre, by using different materials and narrative elements, which, in combination with spatiality and local culture, activate the viewer’s mechanisms of meaning production and aesthetic discovery. 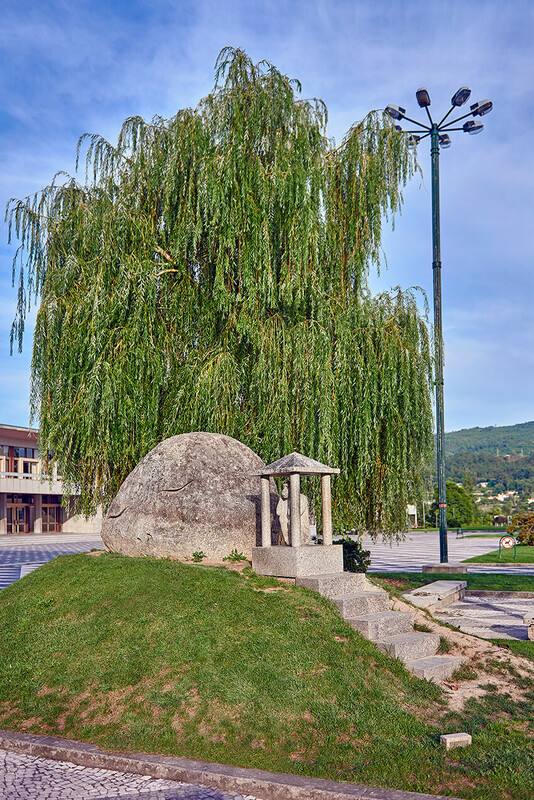 O guardião da pedra que dorme [The guardian of the sleeping stone] is an eminently figurative sculpture built in Santo Tirso in 1999. By means of a pair of shallow slits, resembling closed eyelids, and two rudimentary nostrils on the granite surface, the hard stone has been transformed into a torpid creature who needs to be protected in its indolent sleep. Yet, the piece’s most important feature is the pungent irony embodied by the schematic monkey watching the sleeping stone from a sentry box. This guarding monkey is the central figure, ignoring the bustle in the park, watching us from its vantage point and demanding silence with a gesture filled with irony and humour.